Last week I discussed why an invoice (take by itself) is not a contract. As was stated, it only shows a quantity and a price, but there is no evidence that the side being sent the invoice has accepted those terms. Unless they have signed or there is another underlying contract an invoice alone does not make a contract. During that week’s discussion I briefly mentioned a bill of sale. If you remember in the court case I quoted it stated that an invoice is not a bill of sale, which is true. A bill sale, unlike an invoice, facilitates a transfer of title to property and at the same time evidences contract. Why is a Bill of Sale a Contract versus An Invoice? If you remember the several Draw the Law posts about contract law, I mentioned that a contract requires mutual assent (which is offer and acceptance) and consideration. In your typical bill of sale the seller agrees to sell the property to the buyer, if the buyer signs according the to the terms of what is described in the bill of sale there is acceptance of that offer. The consideration is the underlying exchange of cash for title to the property. Notice that there is a transfer of property and a contract in one document. Is there a Difference between Property Law and Contract Law? Yes, there is a difference between the two; much of the confusion in our modern usage of legal terms comes from the fact that property and contracts law are tend overlap in many instances, such as in a real estate deal. However, the two of them are very different. The rights that arise under property law are different than the rights that arise under contract law. Generally (and simply) speaking, property law gives rights to the owner over something (i.e. land or a car) to be enforceable against other persons. However, contractual rights give you enforceable rights against a particular person. Today’s document, the bill of sale, transfers ownership over something, thus giving the buyer the ability to enforce their rights over their newly acquired property against all others. However, the exchange of valuable consideration between the two parties, for instance money for a car, gives the two parties contractual rights to sue against each other if the terms of the deal are broken. Contrast this with a contractual agreement that does not grant the nonowner a property interest, nor the rights to enforce against all others. For example, a license for copyrighted software – remember you the software user are only granted a license. Therefore, you cannot enforce the copyright against all others whereas the software maker can, all you can enforce is that you did not receive access to use the software or it malfunctioned and the company can enforce you went beyond the license or you did not pay them for it. Do Bills of Sale Require Any Other Information? In many states (as well as under federal law), for particular pieces of property, such as cars, boats, land, etc . . . the bill of sale also requires other specific information to effect the transfer and evidence a contract. For example, check the City and County of Honolulu’s form for a bill of sale for a car at this link. On the form you will see the need to state the mileage of the vehicle and have it notarized. So two weeks ago I discussed a marketing agreement (aka reseller agreement). This was where you would allow someone to (re)sell your product or service for a fee. The benefit of such an agreement should be clear to those who can produce a lot, but lack distribution channels. As I said, I will be for several weeks charting some of the type of agreements you will come across as a business. Today I will focus on another type of contract that you might consider making, a licensing agreement. Instead of selling your product or service to another, a licensing agreement allows another person to use your product or service. The key word here is “use”, as with a licensing agreement the person who may be utilizing the product or service has no ownership. In today’s electronic productive world, there is something that you should realize by now. Most of your software (if not all) is not yours. Why? You have been granted a right to use the software through a licensing agreement., which means you cannot reproduce copies of your software and give those copies to friends. It is a violation of a the licensing agreement. This is why the term End-User License Agreement (EULA) pops up as you install a game, office suite, or some other type of software. What the EULA says, more often than not, as you scroll to the bottom of the long document to click “I Agree” is you are the end-user, thus you get a license, and you understand you don’t own the software, nor will you copy and resale in en masse. Now what does that mean for you small businesses with a strong brand or startups that are producing the next awesome software for everyone to use. You can use a licenses to parse rights outs, the best example I can think of the art of licensing is you have a pie and you can choose to cut it up in any way you see fit (barring restrictions from the law). Let’s take a copyright license for a comic book. You own the right to copy (which includes derivative works). So let’s say you give the rights to “copy” to a movie company to produce a theatrical release, you give another license to a publishing company to do a novelization, then another to a Broadway producer to make a musical, finally you grant another license to a troop of interpretative dancers to perform the story on the street and open-air fairs. These are all licensing agreements to use your right to copy a derivative work off of that one original comic. Exclusivity – is the licensee the only one who gets the right to use? In one region? Payment – does the licensee pay a one-time usage fee or do you make periodic payments? Time – is the license forever? Is it finite? Does it end if a certain event happens? Control – does the licensor have a right to dictate the quality, delivery, etc . . . of the product or service? Indemnification – will the licensor move to defend the licensee if they get sued for using the product or service from a third party? These are only a sliver of things to consider when using licenses. As always while you may have your own basic ideas of what the objectives of your deal is it is best to go to an attorney to reduce your intentions to writing, especially when it comes to licensing intellectual property, land-use, and agreements that are to last beyond a year. Hi everyone, on the last post I briefly touched upon using your home as the location of your business. Today’s post will focus on zoning and all the complexities that brings to setting up your business. Similar, to how neighborhood associations or condo groups want a certain look, so they enforce covenants against members the government also wants to shape and control how the land is used. This is accomplished through zoning laws. 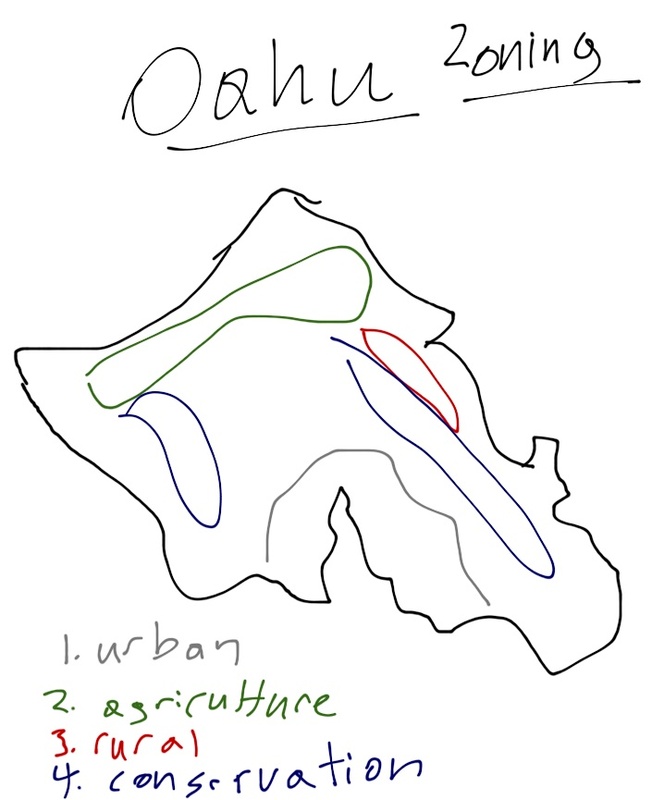 All land in Hawaii (except for federal land) is one of four categories: (1) conservation; (2) agricultural; (3) rural; and (4) urban). The four designation were created by the State Land Use Commission. The Zoning Code lists what are the permitted uses within each zone. It also lists the required setbacks, height limits, parking areas for commercial developments, and other such types of requirements. Every zone has a list of what is a “permitted” use without need of further approvals. It’s the reason you see gas stations and strip malls where you do, and away from your houses. In general, when looking at a location you want to make sure your business will be able to meet the requirements. If you are set-up shop in one area and violate the zoning requirements it could be very costly and be so severe as to drive you out of business. In addition to the land use, construction of buildings need plan approvals from the Planning Department as well as the building itself needs a building permit, which ensures that the building is for the permitted use and has proper set backs. 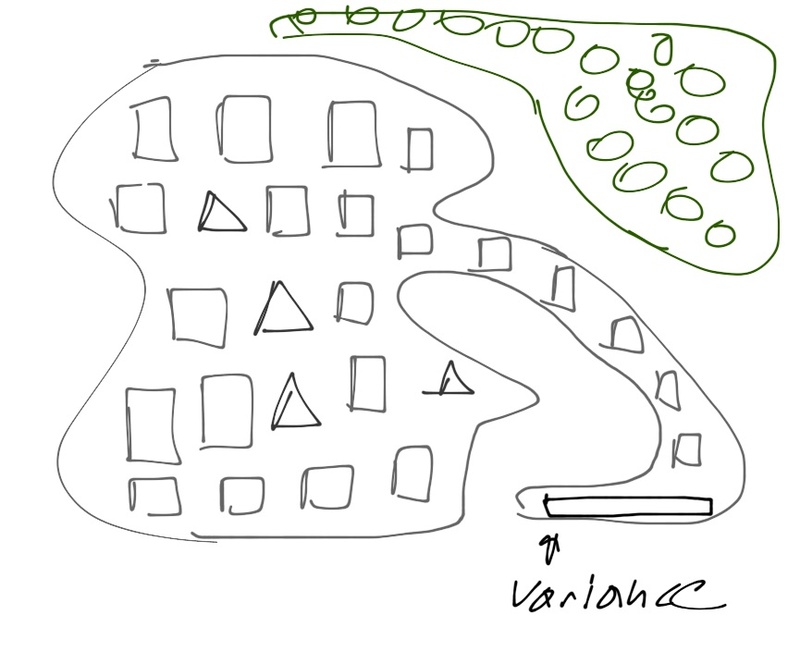 In some occasions you can get a variance to allow for some type of use not allowed in the zone, such as the shape of the lot allows you a different setback. It is also possible to get a Land Use Approval for others kinds of use. However, in general to get a variance or Land Use Approval it can be a long process. For more information on the matter (for Oahu) visit the City and County of Honolulu’s Department of Planning and Permitting page. In addition, when dealing with zoning laws it is best to seek an attorney and other land use professionals to help best explain the complex system. Before I end out this Draw the Law, I’d like to make brief mention with licensing and permitting, which dovetails nicely with zoning. I already made mention of building permits above, but suppose you say you start your business and you have structures you want to alter or demolish. You will need a building permit for such actions. 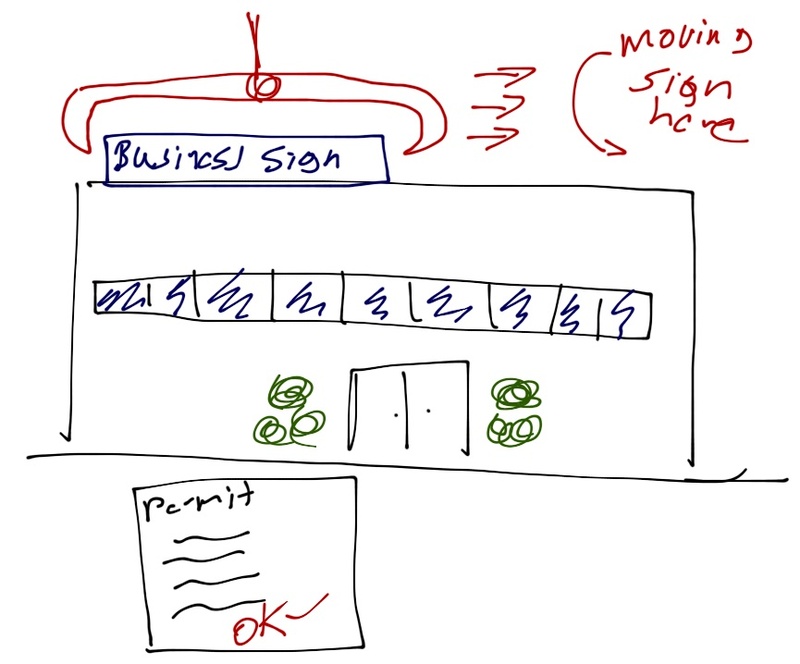 There is even a sign permit if you want to install, construct, alter or move any sign on the property! Certain businesses also require a license to be operational for business. The best example of this is the liquor license. A bar cannot operate even though it meets all the other zoning requirement without a liquor license. For example, let’s say it is the right-sized building for bar operation on a lot in Waikiki or Downtown that allows bars, but the owner fails to obtain the proper liquor license to sell drinks. He would not be able to open his bar and sell drinks until he gets approval from the Liquor Commission via a license. Therefore, the need of having all your ducks lined up when opening certain businesses is paramount. It takes a lot of time, paperwork, review, and discussion with the government. As always if you like this post or any of my other series please Subscribe to this blawg to receive updates to your e-mail. In addition, follow me on Twitter @Rkhewesq and Like Me on Facebook under Ryan K. Hew. If you need to contact me directly, please e-mail me at Ryankhew@hawaiiesquire.com. See you on the next Draw the Law!